On October 4th, Gov. Jerry Brown signed two new laws that will dramatically impact restaurant operators. The first law makes California the first state to prohibit full-service restaurants from automatically giving out single-use plastic straws. On the same day, he also signed a bill that requires milk or water to be the default drink sold with kids’ meals at fast-food and full-service restaurants. The plastic straw legislation requires that guest must ask for a straw before it is provided. 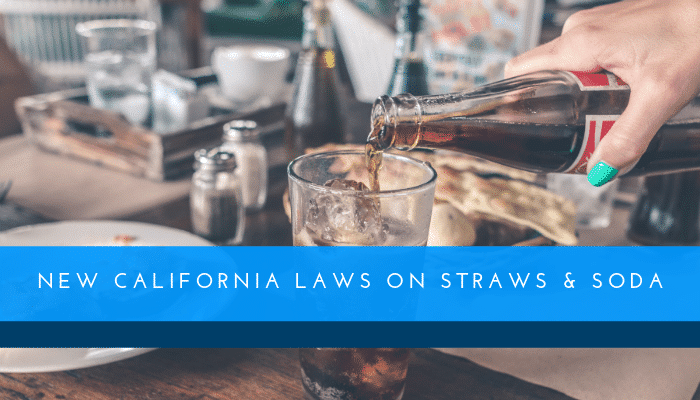 While this law does not go as far as city laws in Santa Monica, San Francisco, or Seattle that ban straws outright, it does mark a significant shift away from plastic supplies, and a move toward more eco-friendly business operations. Governor Brown has made environmental issues a priority in hopes to limit the large amount of plastic waste dumped into the ocean every year that endanger wildlife and contaminate the food and water supply. The Los Angeles Times reported that the California Coastal Commission recorded approximately 835,425 plastic straws and stirrers during beach cleanups.1 California restaurants that do not comply with the straw law will receive two warnings before being issued a fine. Lawmakers changed the legislation to add a $300 annual fine limit. It will apply only to sit-down restaurants where customers are waited on by restaurant staff, not fast food establishments. This law will be enforced by health inspectors. While SB 300 still permits restaurants and fast food chains to continue to sell soda or juice with kids’ meals, it states that only milk, a non-dairy milk alternative, or sparkling, still or flavored water can be handed out as a default and advertised on the menu. According to the Hill, the American Cancer Society is a supporter of the new law. For better or worse, restaurant operators have to consider the implications of these law changes on the bottom line and prepare for implementation before the law takes effect on January 1st. For more information on the new law changes and how to prepare, contact us today. If you have questions regarding our restaurant services, schedule a call today. Ghost Restaurants – Do you know where your delivery food comes from? Accountants | Auditors | Consultants | CPAs – KROST CPAs & Consultants is a certified public accounting and consulting firm focused on serving companies across Southern California (CA) with offices in Pasadena, Woodland Hills, and Valencia. Since 1939, KROST has assisted businesses and individuals reach their financial goals through their in-depth knowledge of Tax, Accounting, Assurance and Advisory, M&A, Wealth Management, and Consulting Services. KROST also provides specialty tax services such as Cost Segregation studies, R&D tax credits, Green Building Tax Incentives, Repair vs. Capitalization, Fixed Asset, IC-DISC, and more. For additional information contact us at 626-449-4225.